Congressional Republicans Split With Trump On Russian Hacking, Urging Investigation : The Two-Way A bipartisan group of senators tacitly rebuked President-elect Donald Trump in a statement Sunday on the CIA assessment that Russia used cyberattacks to influence the election. 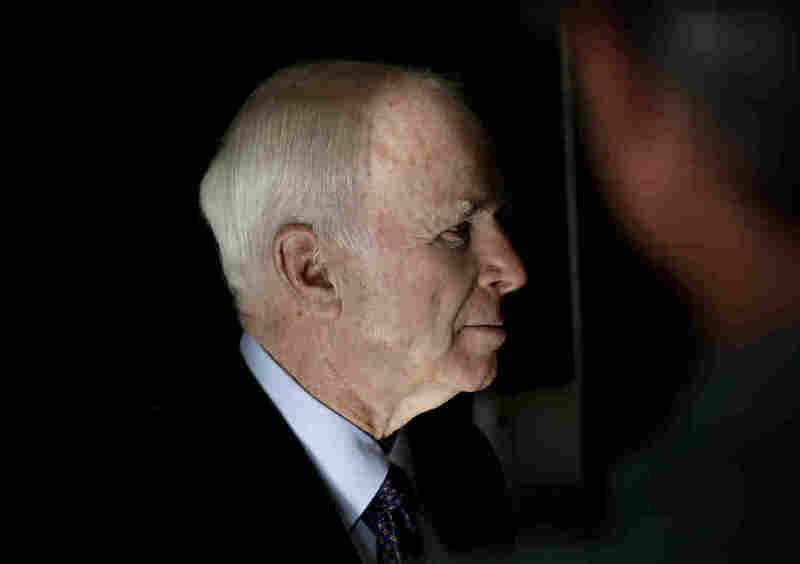 Sen. John McCain, R-Ariz., in Phoenix. "Congress's national security committees have worked diligently to address the complex challenge of cybersecurity, but recent events show that more must be done," the senators said. "While protecting classified material, we have an obligation to inform the public about recent cyberattacks that have cut to the heart of our free society. Democrats and Republicans must work together, and across the jurisdictional lines of the Congress, to examine these recent incidents thoroughly and devise comprehensive solutions to deter and defend against further cyberattacks." The statement was a tacit rebuke of President-elect Donald Trump, who has said he doesn't believe the CIA, which concluded Russia intervened in the 2016 election in order to help him win the presidency. The reaction from congressional Republicans sets the stage for hearings next year on Russian interference on Capitol Hill as the new Republican president dismisses the issue. Trump dismissed the CIA assessment as a partisan hit in his appearance on Fox News Sunday. "I think the Democrats are putting it out because they suffered one of the greatest defeats in the history of politics in this country," Trump said. He also referred to "a massive landslide victory" in the Electoral College. While Trump's victory may have been the most stunning upset in American political history, it was far from historic in size. Trump won 306 electoral votes to Hillary Clinton's 232, which ranks as the 46th largest Electoral College margin, out of 58 elections. Trump is also behind Clinton in the popular vote by 2.8 million, by far the largest popular vote deficit ever for a winning candidate. On Face the Nation on CBS, McCain said that no matter what Trump says the facts are clear: Russia conducted cyberattacks in the United States to try to influence the election. "Now whether they intended to interfere to the degree that they were trying to elect a certain candidate, I think that's the subject of investigation," McCain said. "But facts are stubborn things, they did hack into this campaign." McCain said that this issue is bigger than partisan politics because it affects free and fair elections, the bedrock of American democracy. He said he would prefer for a special committee to take on the investigation, but this is such a serious issue that his Armed Services Committee will start work right away. Rep. Michael McCaul, R-Texas, who chairs the House Homeland Security Committee, has also called for an investigation. Other House Republicans, including New York Rep. Peter King and California Rep. Devin Nunes, a major Trump supporter, have said they do not doubt Russia is responsible for the cyberattacks. That's to say nothing of the outcry among Democrats. On Friday, President Obama ordered a full review of "malicious cyber activity" that coincided with the elections, which could result in a report just as Trump is taking office. The review will go all the way back to 2008, when China was found to have hacked both the Obama and McCain presidential campaigns. McCain said he welcomed Obama's review, but he also cautioned that a comprehensive investigation would take much longer than the time Obama has left in office.